Let’s talk Oreos … I’m about to date myself … do you remember when there was only one type of Oreo cookie? It was very exciting when Double Stuf Oreos were born in 1975! Double filling … wow! Today, I can’t even tell you how many varieties are available … Peanut Butter, Mint, Birthday even Triple Stuf. Do new varieties pop up every time I go shopping? I think so! I didn’t really know what to call these flowers … fun, silly, whimsical? My vision was to create roses, but got I funky flowers instead. This time, I didn’t even ask for family opinions … pretty sure the description may include dorky … I know when not to ask! 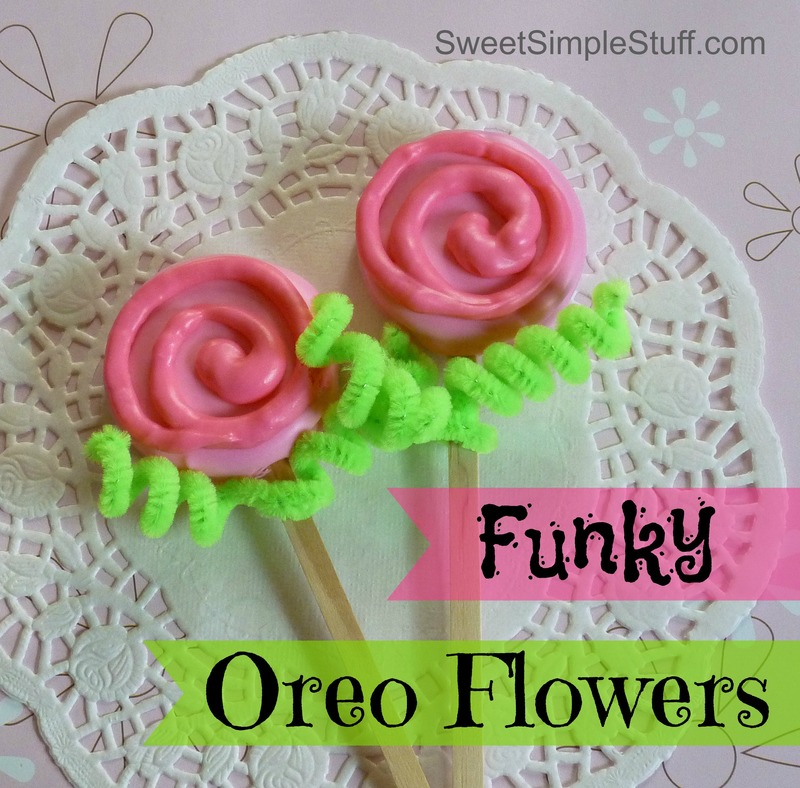 However, the family sucked these Oreo flowers right off their sticks! Son #3 did say that I used too much white chocolate!!! Can you believe that comment … too much chocolate? This is the first time I bought Heads or Tails Double Stuf Oreos … you can use whatever flavor you like, however I do recommend using Double Stuf. The thicker center makes it easy to insert a stick. Melt the pink candy and put about 1/2 cup of the melted candy in a squeeze bottle or pastry bag for swirl decoration. 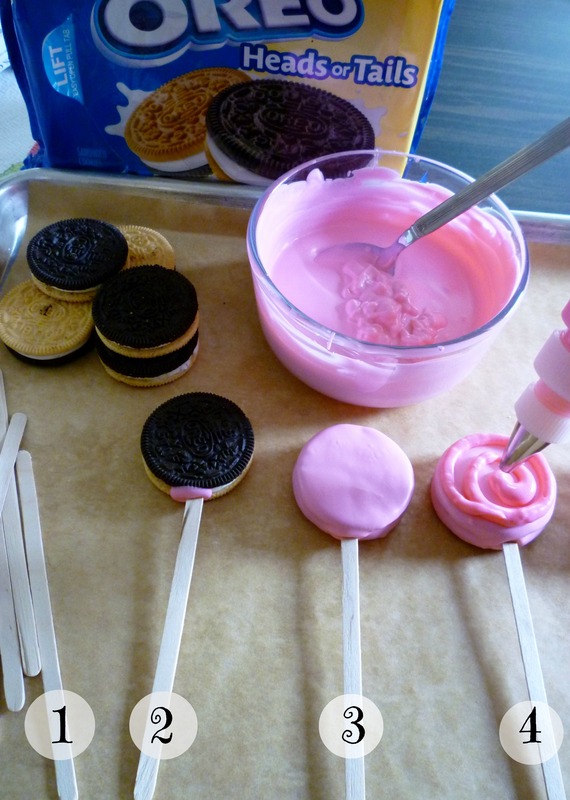 Melt the white candy and add the remainder of pink candy to create a lighter pink for dipping. This is my hint of the day – If your cookies tend to crack when you insert a stick … place 3 cookies in the microwave for 10-15 seconds … it softens the icing. Brush all loose crumbs off cookies. Dip the tip of a stick in melted candy and insert it into the cookie icing, allow to sit a few minutes and firm up. Dip cookie in melted candy, tap off all excess candy. lay on prepared tray. Chill for a few minutes or sit at room temperature. 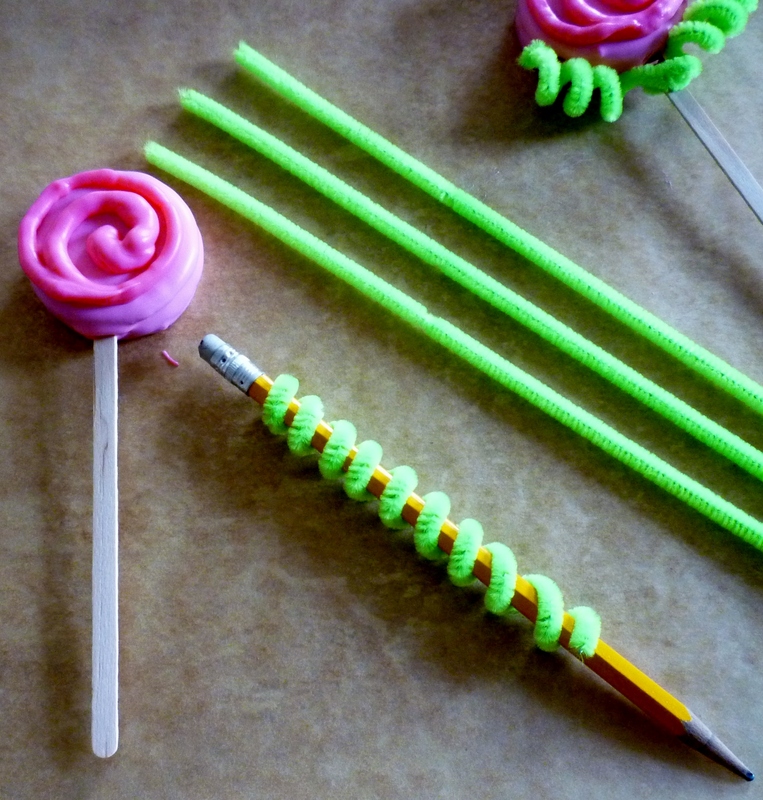 Make funky leaves … wrap a chenille stem around a pencil, slide it off and twist it around stick. Pretty easy peasy … and who doesn’t like a chocolate dipped Oreo? Cute and Funky, you were right, this is just what I have been looking for to make for a craft fair. Hope you do not ever change your home page, every time I see those cute bowls with all the different candies in such cheerful colors I get a feel good feeling, like I can do this also. Love your site. Thank you Kelly 😉 I wanted to change my home page, but I couldn’t figure out what to do. Maybe it should just stay the way it is! Another cute Brenda Creation.. Love it. These are awesome Brenda! SO cute! These are so CUTE!!! Thanks for the tutorial and the tip about placing the cookies in the microwave to help with the sticks. Too much chocolate? Never!!!! I think they look adorable!!! Brenda, I so wish I could be with you in your kitchen, watching, helping, tasting! I’d be prepared to catch it! We could even have a competition of some kind with flying chocolate! These are adorable. The perfect idea to help my kids through the final exam time. They can eat and take their tests. Great tip on putting the cookies in microwave for a minute to loosen them up a bit. 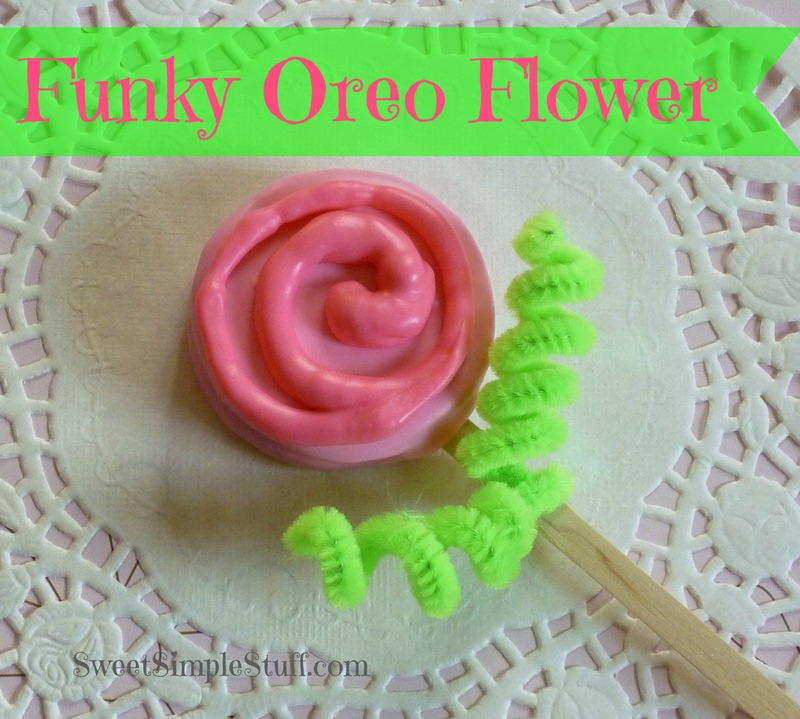 What an adorable Oreo flower! Great idea for parties!